LibreOffice 4.3: "you can't own a better office suite"
The Document Foundation has announced LibreOffice version 4.3, its latest major release. Originally created as a fork of OpenOffice back in September 2010, and constantly improved by hundreds of open source developers, this suite is Microsoft's major offline productivity competitor. LibreOffice 4.3 is said to have reached a point of maturity and boasts an array of major improvements making it suitable for nearly every kind of deployment. The organisation behind the suite states that its products are now being used by over 80 million active users around the world. That's a big step up in popularity in recent years, as only 10 million users had downloaded the software by September 2011, according to CNet. "The LibreOffice project shows that a large free software community can live and thrive without the patronage of a software vendor, to liberate PC desktops," wrote Thorsten Behrens, Chairman of The Document Foundation, in an email to HEXUS. "Today, you can't own a better office suite than LibreOffice, in term of features, interoperability, support for document standards and independence. After many years, LibreOffice brings the control of the PC desktop back into the hands of the users". Improved document interoperability with a range of document types include; "support of OOXML Strict, OOXML graphics improvements (DrawingML, theme fonts, preservation of drawing styles and attributes), embedding OOXML files inside another OOXML file, support of 30 new Excel formulas, support of MS Works spreadsheets and databases, and Mac legacy file formats such as ClarisWorks, ClarisResolve, MacWorks, SuperPaint, and more." Spreadsheet program Calc will also allow more intuitive multi-tasking with the update, "thanks to the smarter highlighting of formulas in cells, the display of the number of selected rows and columns in the status bar, the ability to start editing a cell with the content of the cell above it, and being able to fully select text conversion models by the user." 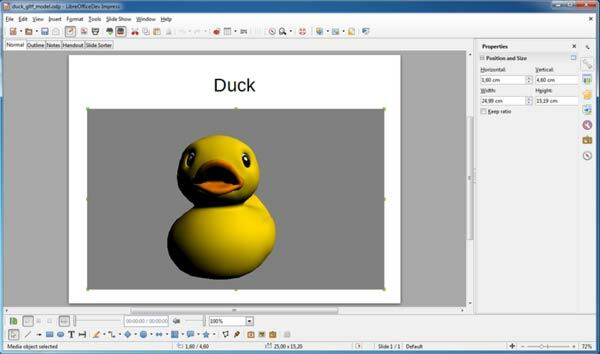 3D models in presentation application Impress can now be inserted in the new open gITF format, although support for the feature is currently on Windows and Linux versions only. According to the release notes of LibreOffice 4.3, "to use this feature, go to Insert ▸ Object ▸ 3D Model." That's nice and simple. Lastly, the update will also provide better comment management as "comments can now be printed in the document margin, formatted in a better way, and imported and exported - including nested comments - in ODF, DOC, OOXML and RTF documents." Commenting and annotation funcmtions are important to many people's collaborative and team working. A longstanding 11 year old bug in the OpenOffice architecture has also been fixed with version 4.3, with support for "monster" paragraphs exceeding 65,000 characters which would have previously caused program stability problems. Interestingly LibreOffice's source code quality is also said to have been dramatically improved since October 2012 with the "reduction of the defect density per 1,000 lines of code from an above the average 1.11 to an industry leading 0.08". If you want to give LibreOffice 4.3 a whirl you can get it from here. LibreOffice is probably one of the best FOSS office suites, but if I was putting my business documents through a suite, I'd still want it to be MS, purely because on-the-go support is baked in. Not only things like cloud storage across sites, but mobile versions for heading out with them. If you don't need those features, LibreOffice will get you by just fine for SOHO users. I wonder how long it will be until they start offering 64-bit versions for Windows, as they already do for Linux and Mac. While I've used OpenOffice and Libre, to one extent or another, I'm a little leery of “can't own better” type claims. For my use, and I'm firmly in the SOHO category MaverickWill referred to, Libre is fine, perfectly adequate, and …. free. And for my purposes, one of my issues with MS (Office, and Windows) is precisely that cloud support is increasingly baked-in. I've come across some IT managers in medium, and even large, companies with some issues over that, too. I spent some time in a general office with sales and marketing staff, and that sentence makes me shudder. Most users of word processors and spreadsheets couldn't care less what is under the bonnet as long as it is familiar and works. Whether you like MS Office or have a moral objection to paying for software it is ubiquitous. If the figure of a billion users is correct the next person to walk in and sit down at a desk is 12,500 times more likely to be able to start using Word (whatever its flaws) immediately than this. When my Office365 was due to expire I looked into OO but the fact that any part of it requires java lead me back to M$.